Some screenshots of the in-progress next generation Al Jazari livecoding world. 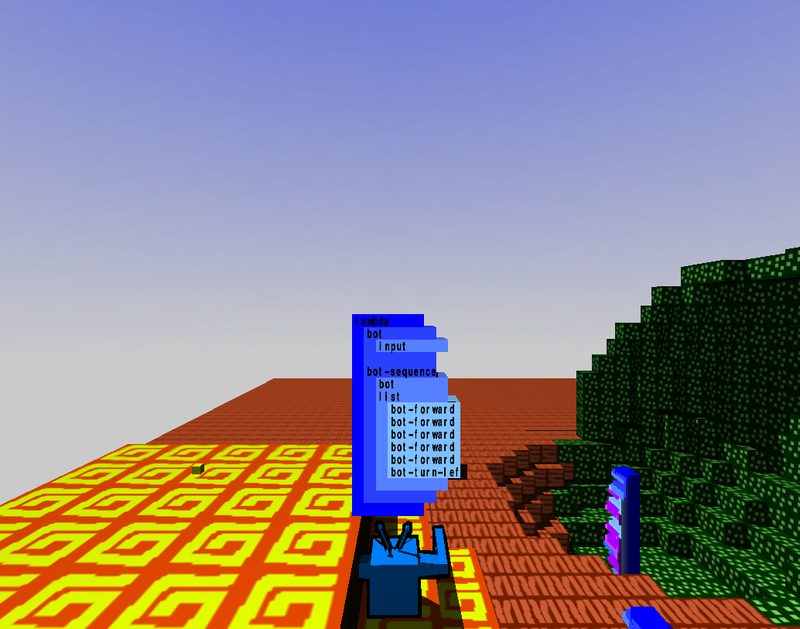 This is a voxel rendered world, inspired in part by Minecraft but with an emphasis on coding robots in scheme bricks who construct artefacts from the materials around them. The robot language is still to be designed, but will probably resemble Scratch. You can ‘jump on board’ the different robots (cycling through them with ‘space’) and program them with commands which include picking up or dropping individual blocks. The program above allows you to control the robot with the ‘w’, ‘a’, ‘s’, ‘d’ keys with ‘z’ to tunnel downwards, and ‘x’ to remove the block in front of the robot. 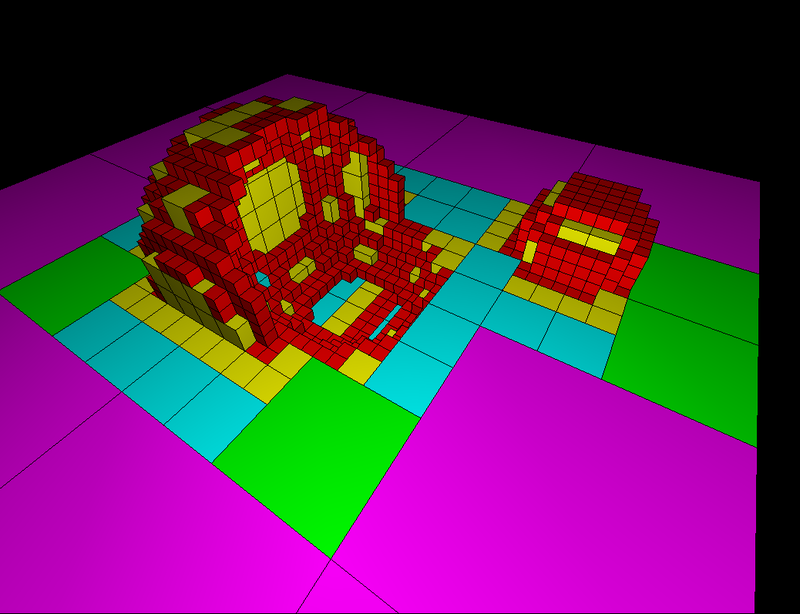 The world is built quite simply from an octree – which provides an optimised structure for rendering the 64x64x64 level cube in realtime. 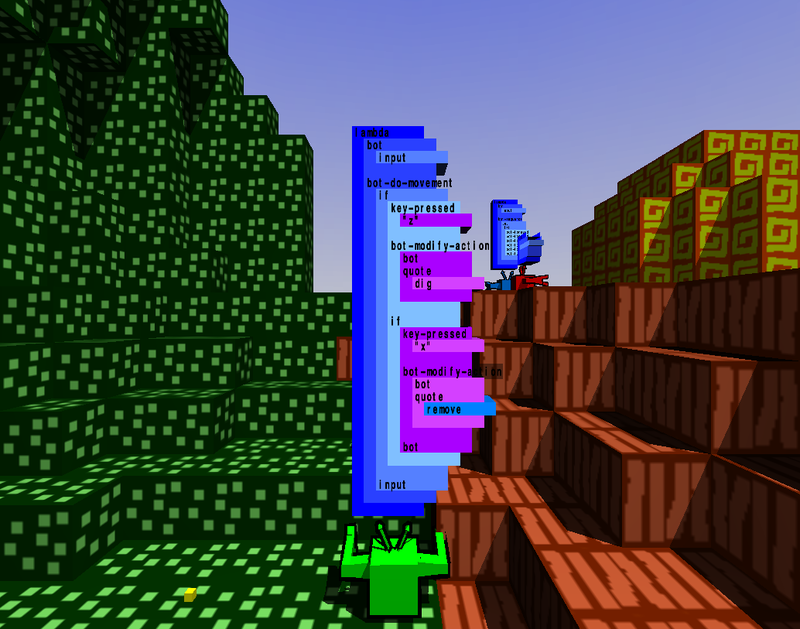 The view below shows the compression – large areas containing the same material (or empty space) can be represented by leaf nodes terminating the tree early without needing to store each of the 262,144 1x1x1 cubes. After each edit, the octree may fragment or collapse it’s tree (via setting new values in 3D space or a ‘compress’ operation). The scheme code can be found here. ridiculous as ever Dave 😉 looks really good, i’m reminded of “the sentinal” & “populous” if you remember those. yesss, the sentinel was an early, and probably subconscious influence! Yes! Possibly lemmings who can reprogram each other.